This story was updated at 9:22 p.m. EDT. A space clown and two professional spaceflyers are due toreturn home to Earth Sunday from the International Space Station. The trio closed the hatches between their Soyuz spacecraftand the orbiting laboratory at 6:06 p.m. EDT (2206 GMT) and undocked at 9:07p.m. EDT (0107 GMT Sunday), after saying farewell to their crewmates stillonboard the station. 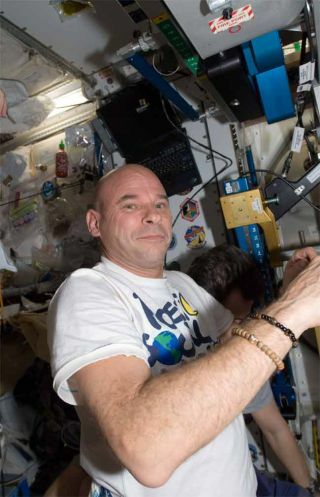 Canadian space tourist and circusclown Guy Laliberte - the founder of Cirque du Soleil - wore his trademarkred clown nose as he hugged the station residents goodbye. "I would like to express my gratefulness to all mycrewmates," Padalka said during a ceremony to hand over control of thestation to Belgian astronaut Frank De Winne. "Without my crewmates I wouldbe nothing as commander." The spaceflyers are due to land in Kazakhstan aboard aRussian Soyuz spacecraft at 12:31 a.m. EDT (0431 GMT) Sunday. Laliberte is wrapping up an 11-day paid trip to space, whichhe dedicated to raising awareness for water conservation. His mission culminatedin a performance he hosted Friday night from space, in which artists in 14cities around the world used dance, song and poetry to celebrate water. For his part, Laliberte, who paid more than $35 million tothe Russian Federal Space Agency (through the U.S. firm Space Adventures), saidthe trip was worthevery penny. Padalka and Barrat are completing a six-month tour of dutyon the orbiting laboratory, where Padalka served as commander of the Expedition20 mission. On Friday he handed control of the station over to European SpaceAgency astronaut FrankDe Winne of Belgium, who became the first European station commander.